The Greene County Libraries Association recently had a series of free performances this week. Storyteller and comedian Will Stuck performed two different shows on Monday and Tuesday. Stuck explained the differences between the two shows. Monday’s “Rumpus” shows were at the First United Methodist Church for the Jefferson Library, then at the Grand Junction Library and H.F. & Maude E. Marchant Memorial Library in Scranton. Tuesday’s “Hoopla” shows were at the Paton, Churdan and Rippey libraries. Jefferson Children’s Librarian Terry Clark said their kids’ Summer Reading Program is currently underway, but it’s not too late to join. The Jefferson Summer Reading Program is for kids ages four-years-old through fifth grade. 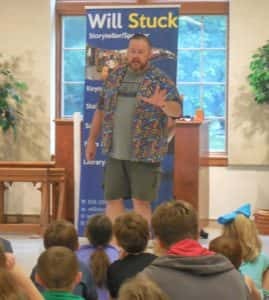 The Will Stuck performances were co-sponsored by the Greene County Libraries Association and the Greene County Board of Supervisors.